I've had the good fortune of never being poisoned by the food I’ve eaten. Foodborne illnesses are common in the United States, some estimates cite as many 3 million incidents a year. Incidents range from simple digestive abnormalities to death. Unfortunately, not all incidents are reported, but for those that are reported the Center for Disease Control (CDC) keeps track of them. 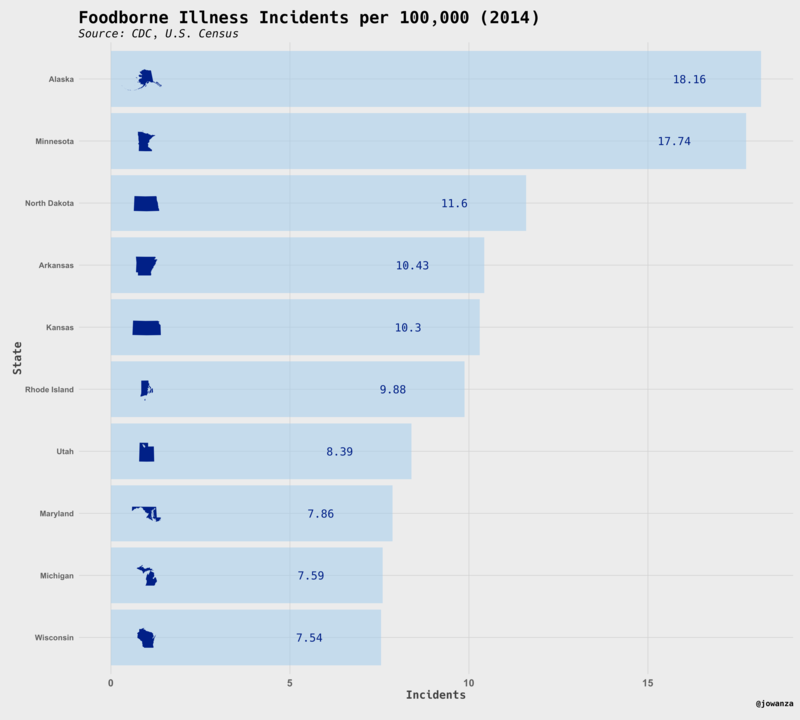 This post is a small exploration of a dataset published by the CDC that tracks foodborne illness incidents in the United States. The CDC publishes this dataset in order to make some foodborne illness data more publicity available. 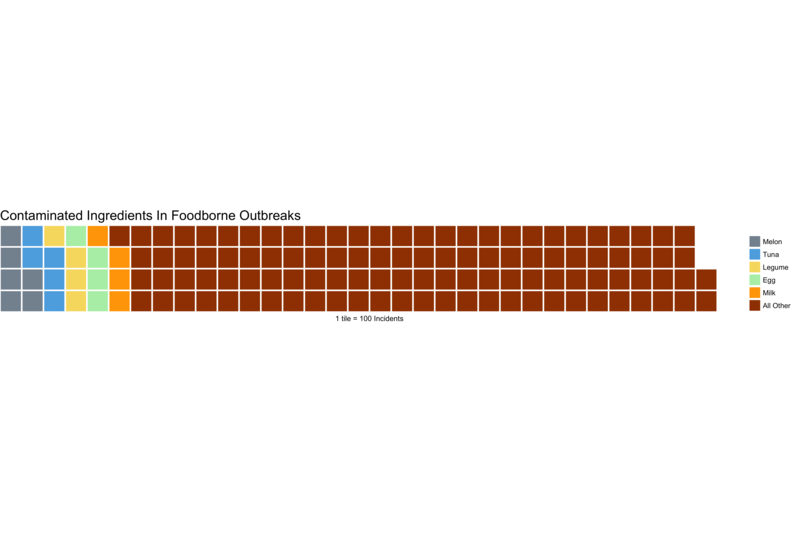 It is not a holistic representation of all food outbreaks. It is important to remember that this is only reported incidents, far more incidents go unreported. Think of the times you gotten sick from food, you likely just dealt with the 24 hour bug and never thought to call a hospital or report the restaurant you ate it. You can see the data in it’s entirety here. 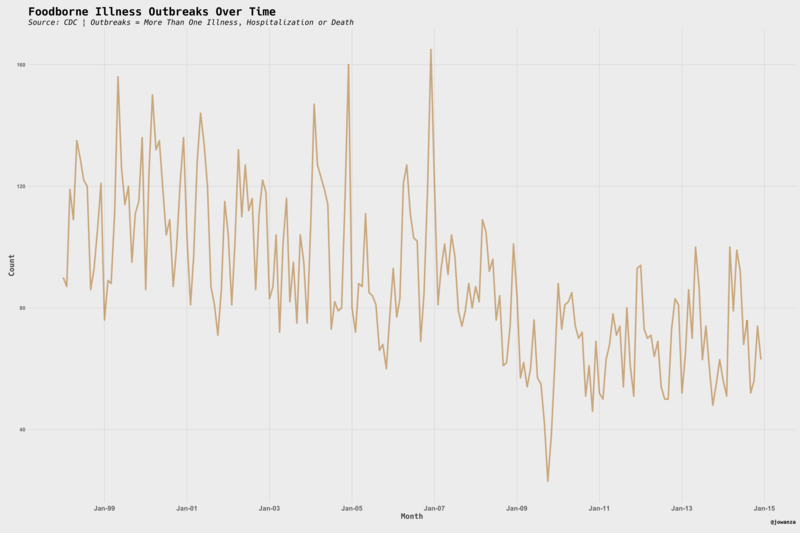 Overall there are far fewer outbreaks than there were throughout the 2000’s. There was a strange drop in incidents in 2010, I looked into it but wasn’t able to find anything definitive. I used the 2014 census and the 2014 data from this sample to calculate incidents on a per 100,000 persons basis. Note: During this same year 983 reported incidents were listed as crossing state boundaries. I found it interesting that melons accounted for such a large amount of foodborne illnesses. Tuna, legumes, eggs and milk are also top ingredients in contaminated food. 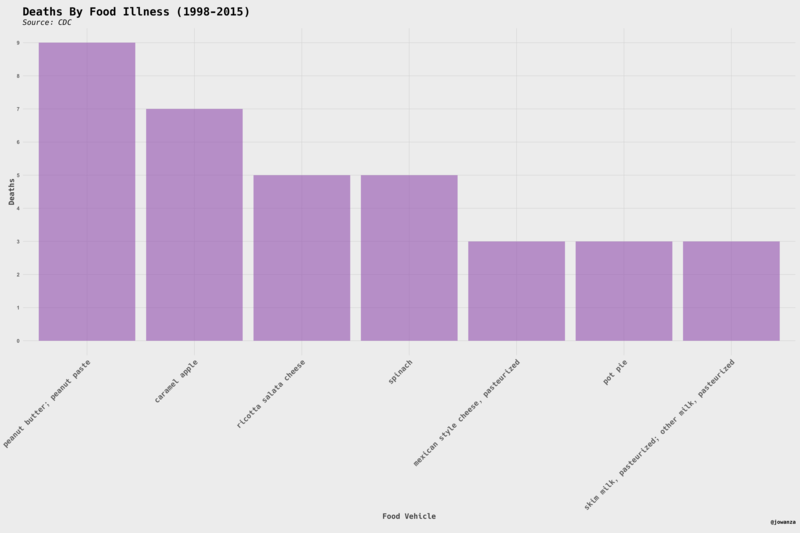 These are the foods with the top number of deaths overtime since 1997. I suspect peanut butter is more of a food allergy, but that is still technically an illness. The data used in this post is from the CDC and is linked above. All code used to generate the graphics can be found here.